After a long weekend spent drinking wine, staying up late and eating greasy food (oh, yeah, and skiing), my hubster and I are ready for a little healthful detox this week. Given the "wintry mix" weather we are having, I thought I would mix up a big batch of wholesome, delicious, vegetable soup. Vegetable soup is so easy to make, is a great way to use up wilty vegetables, and it tastes so much better than canned soup (and it's so much better for you). Plus, if you make a nice big batch you won't have to cook again until you run out or get sick of it! You can sprinkle Parmesan on top if that's your thing, and make some sourdough toast or a green salad to accompany it for a simple supper. It's soup-er! I adapted a recipe from Everyday Food (where this photo came from) and combined it with one from Alton Brown for my own twist. You really can't make a mistake so go wild! 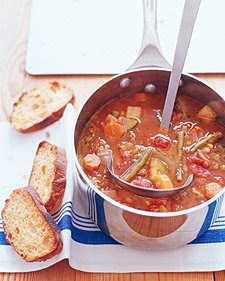 (Or at least as wild as you can get when we're talking about vegetable soup). 1-2 cups each whatever fresh or frozen veggies you have lying around, such as celery, carrots, corn, green beans, peas, lima beans, yellow squash, potatoes, zucchini, spinach...you name it. Just be sure to chop the large veg into smaller pieces, obv. Heat the oil in a large pot over medium heat. Add leeks or onions and garlic and season with salt and pepper. Cook until the onions are translucent (like 5 minutes). Add broth, tomatoes, tomato paste, and three cups of water to the pot. Bring to a boil, then reduce heat and simmer uncovered for about 20 minutes. Feel free to watch TV or something during this time. Add veggies to the pot, and return to a simmer. Cook, uncovered, until all the veggies are tender (roughly another 20 minutes).